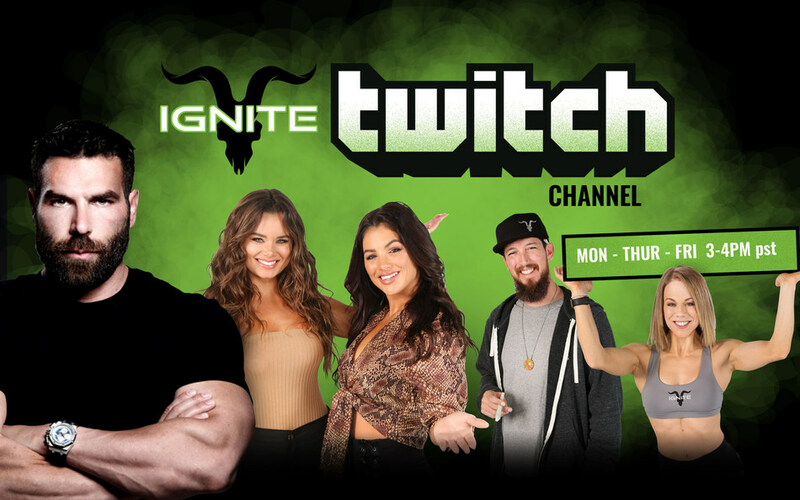 Ignite announced the launch of its new Twitch channel, which shares VIP access to life inside the premium cannabis company along with an inside look at Dan Bilzerian's unique lifestyle at the Ignite house. The channel features cannabis and CBD product testing and education, workout regimes, the Ignite girls and members of the Ignite team that make it all possible. The first episode included segments entitled "The Blaze" and "The Workout." With hosts, Kayla Fitz and Dessie Mitcheson, known from their time on the Amazing Race, season 30, "The Blaze" will take viewers on field trips to budtender events and grows while Josh Carranza, Ignite's Cannabis Professor, shares the latest cannabis and CBD information and technology. With a lineup of weekly special guests, the team will take the audience on a fun and educational ride. "The Workout" hosted by Stacy McCloud, a health/fitness blogger, NPC Bikini Posing Coach, IFBB Bikini Pro Olympian and CBD advocate, who will teach viewers the benefits of cannabis, CBD and working out. Stacey was visited by Dan, the other Ignite Girls and special guests. To celebrate the launch, one winner who follows Ignite's channel will win an all-expenses paid trip to the next Ignite House party. Details were revealed in the debut episode. With more than 2.2 million monthly viewers, Twitch has dominated as a gaming-focused live streaming video platform and has expanded to stream music broadcasts, eSports competitions and creative content. Ignite's Twitch channel will stream from around the world following Dan and his Ignite team on their adventures as they build the first premium global brand in cannabis. Additional shows will launch in the upcoming weeks and months. The channel launched on January 18, 2019 with livestreams Mondays, Thursdays and Fridays from 3:00 p.m. to 4:00 p.m. PT, at which time viewers can see what it really takes to build - and live - Ignite at twitch.tv/ignite. Founded by Dan Bilzerian, based in Los Angeles, and spanning a wide variety of cannabis and CBD products, the company delivers customers superior strains of cannabis and the purest CBD products possible. Ignite has built the world's first super-premium cannabis lifestyle brand, currently for sale in Dispensaries across California with the company's CBD products sold nationally online. From packaging and branding, to what's inside, Ignite delivers at the highest caliber of levels never before seen in this new industry and builds on the foundation that trust and quality truly matter. For more information visit ignite.co/ and ignitecbd.co/. After being honorably discharged from the Navy following a four-year service, Dan attended the University of Florida where he majored in both business and criminology. He then went on to became one of the world's most successful professional poker players, winning over $50 million in a single year. Despite not adhering to any social norms — and continuing to be unapologetically himself — he developed a flawless trustworthy reputation within the gambling community for always doing what he said he would do, a mindset that he's carried with him into numerous investment opportunities, business ventures, and personal pursuits — creating an empire. Now, he's dedicated to build the most trusted brand in the cannabis industry.